As part of the Toronto International Film Festival’s year-long programming, ‘Here and Now: Contemporary Arab Women Filmmakers,’ will see a lineup of nine films by Arab women, including one Egyptian. The programme of award-winning films aims to “explore this vital and growing cinema that remains lamentably underscreened in North America,” as described on the website. The selection offers a wide range of styles, from documentaries to features, and hopes to act as a retrospective and entry point for audiences in North America on the rich works of contemporary Arab filmmakers. “If any overarching theme can be detected in these films, it is how, in different forms and genres, and with different topics and tones, they seek to engage with the world, and ask the viewer to do the same — right here and right now,” an intro to the programme on TIFF reads. Egyptian director Hala Lotfy’s film Coming Forth by Day is among the films to be screened at TIFF Bell Lightbox, a cultural centre run by the festival all year round. Lotfy’s film screens 22 August. Other films include Loubia Hamra (Bloody Beans) directed by established Algerian film producer Narimane Mari, and Tunisian director Raja Amari’s sensual Red Satin, Syrian filmmaker Soudade Kaadan’s documentary Obscure, and Moroccan director Tala Hadid’s non-fiction House in the Fields, the first part of a Morocco-set triptych. Additionally there are two films from Lebanon: Joana Hadjithomas and Khalil Joreige’s A Perfect Day, and Where Do We Go Now? 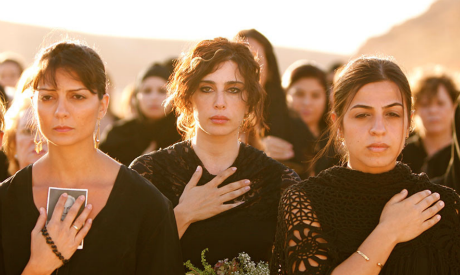 by recent Oscar winner Nadine Labaki and winner of the 2011 TIFF People’s Choice Award. Two films from Palestine will screen: Annemarie Jacir’s Salt of This Sea, and Mai Masri’s 3000 Nights.